On Wednesday, February 2, the Museum joined more than a thousand other organizations, schools, and businesses and took a day off in observance of the powerful—and beautiful—art of snow. The sculpted drifts and chiseled voids captured the nation’s attention. How could one not take notice of the blizzard’s swirling dances and howling bass as the sky and the ground were painted with fluid and at times violent strokes? Many people took pictures, documenting this strange new coating of the landscape. Routines were disrupted, and we were forced to look anew at the buildings, streets, and passageways we often dismiss as we go about our day. We’re reminded of our mortality and our insignificance. We both fear and delight in the choreography of hundreds of millions of snowflakes. Artists often take objects from our lived environment and place them within a gallery. The change in context challenges our understanding of the object’s function and associations within our daily lives; at the same time, the artist is asking the question, what is art? I’m inclined to ask what effect a gallery that has been brought to freezing and filled with snowdrifts and icicles would have. It would, no doubt, be different than having a whole city, state—region—brought to a halt. One role art plays is to try and alter our perception of our known surroundings, our world. Similarly, this blanketing snow has forced us to carefully observe what is there and what is not (because it is now hidden from view). Snow, of course, is not the result of a creative act. No human hand crafted this installation of snow on the region’s canvas; it is not an expression of one’s imagination. But we can still pause before its ability to bring a new type of life to our everyday—if only for a day. The Museum serves us in facilitating our ability to see and appreciate art. But sometimes—sometimes—even the Museum must bow down and exhale—in awe. 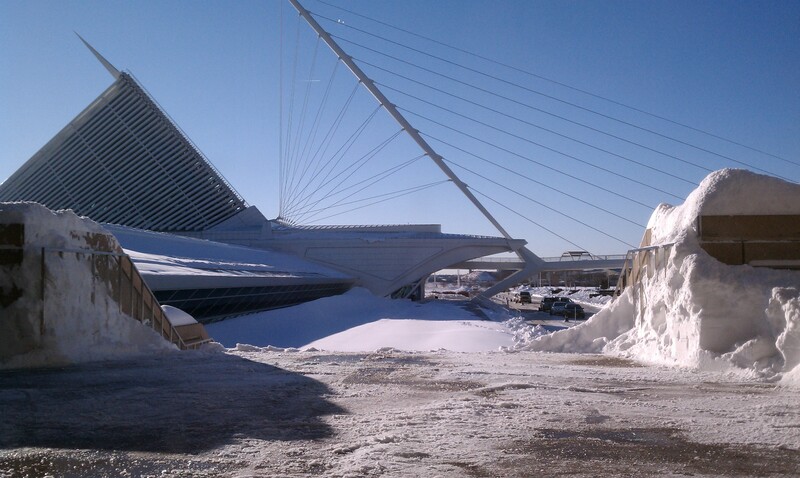 Share your photos of the Museum from the blizzard on the Museum’s Facebook page. This entry was posted in Behind the Scenes and tagged snow. Bookmark the permalink. Can You Name Five Women Artists?